MARKETS CRASH AROUND THE WORLD! DOGS LIVING PEACEFULLY WITH CATS! Every time I pick up the newspaper the headlines get worse. I get it!!! I'm poor! You're poor! We're all poor! Every last penny, pence, drachma and centavo has disappeared from the face of the Earth, sucked up by the evil financial genius, Lehman Defaulto. I already have a new job search plan. I'm going to put on a sign that says "Will work for mortgage payments" and then stand at the end of the closest exit ramp to a highway. Of course, my plan involves standing in the middle of the ramp, at night, wearing all black. There are some flaws to this plan, but I feel chances are good it will accomplish my ultimate goal. Come on folks, let's relax a little bit. One share of Ford Motor Company stock now costs less than a grande latte at Starbucks. Am I the only one who thinks that 's a bit odd? Remember, if all goes well, the sun will come up tomorrow. Most of us will still have jobs and life will go on. Maybe life won't be quite as fancy as it once was (like say, last month), but it will go on. So for the rest of this post I'll assume we've all lived to see another day and that we're hungry. Cooking for yourself instead of going out to dinner can save you a lot of money. Some of the recipes here, like Fettuccine with Prosciutto are amazingly inexpensive if you make a substitution or two, (it's ridiculously cheap if you know how to make your own pasta, but that's a post for another time). When things get really bad, there's one word that immediately comes to mind: soup. You have a bad cold? Soup! It's cold outside? Cuddle up by the fire and have some soup. Late at night and don't know what to eat? Have a bowl of soup. Prep Note: This soup is completely pureed so there is no need to precisely chop the vegetables. In a dutch oven (Le Creuset) cook bacon until crisp. Drain on paper towels, reserving 1 to 2 TBSP bacon fat in the pan. Add the onion, leek, garlic and bay leaf and cook over medium heat until vegetables are soft, about 5 minutes. Add squash, apple and salt and pepper to taste. Cook for 2 more minutes to mingle flavors. Add stock to the pot so that it covers the vegetables by an inch. Simmer over medium heat until the squash is tender, about 15 minutes. Discard bay leaf. Turn off the heat. 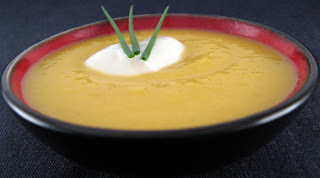 Use a stick blender to puree the soup completely. Otherwise transfer the soup to a blender or food processor and puree in batches. Return to the pot. If soup is too thick add stock to achieve desired texture. Stir in the cream. Serve topped with a dollop of sour cream, apple slices and crumbled bacon. Note: You can easily make this a vegetarian dish by eliminating the bacon and substituting olive oil for the bacon fat. Use vegetable stock in lieu of chicken stock. Double the ingredients for a large crowd. The soup can be made in advance and reheated as you need it. It also freezes well. Serve with crusty bread and a salad and you have a nice lunch. Consume the entire pot and you have a filling dinner. OK crablings, try not to let the news get you too down. You still have to eat, so remember, you can do it, you can cook. and eat deliciously we will with soup like this.....! 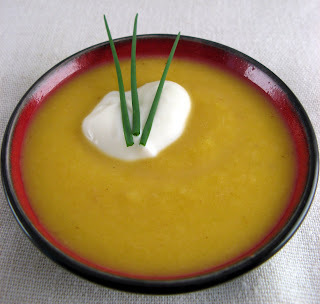 I really like the combination of butternut squash and apple; they really work well together. And I also like to use coriander and cinnamon with them. For some reason it really brings out the flavors in the squash and apple.